This painting has long been attributed to Stefano da Verona, who was active mostly in northern Italy and who was a proponent of the International Style. Popular throughout Europe toward the end of the fourteenth century, this style embodies a decorative elegance and an interest in minute detail that derive from northern European painting. 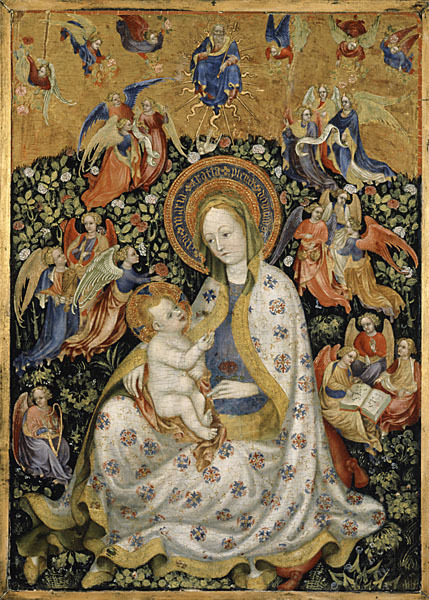 Here the Virgin is portrayed as the Madonna of Humility: instead of being enthroned, she is seated on a cushion on the ground. In the sky above her appears God the Father with a scepter and the Holy Spirit in the form of a dove. The rose garden symbolizes the purity of the Virgin, while the music-making angels evoke the refined and grace-filled court life of the very end of the Middle Ages.